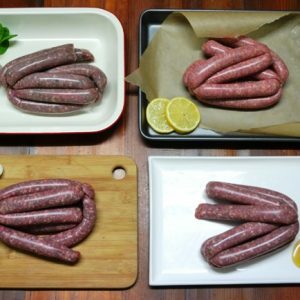 Our Organic Hearty Beef Sausages are perfect for those who require gluten-free, grain-free and preservative-free food! Suitable for paleo, SCD and AIP followers + certain stages of GAPS. We trust that you’ll enjoy the flavour of real beef and quality organic ingredients packed into each sausage. For more information, including ingredients and discounts, see the details tab below. With over 98% beef in each sausage, think of it as a meat loaf in a portable casing! Organic ingredients: Beef, Celtic sea salt, onion powder, sage, water added. Purchase 2kg or more with a meat pack and pay just $12.55/kg (save 10%). To get this discount, please select your sausage quantity on your meat pack page. If you have any difficulties or questions, please email us. No meat pack? 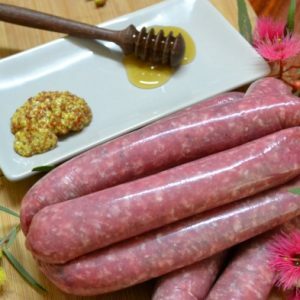 Order 5kg or more and pay $13.25/kg* (save 5%). * If more than 2kg are purchased, sausages will be packed into a bulk bag. BONUS TIP: These sausages are very lean and don’t contain any ‘fillers’. To preserve moisture and prevent splitting, they are best cooked over low heat, and served slightly ‘under-done’. 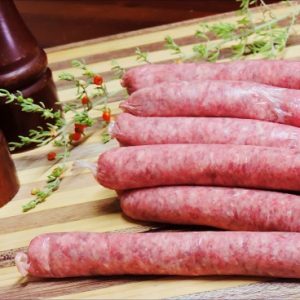 These organic sausages are made with coria casings that are GMO free. They contain cellulose that is sourced from wood pulp, principally from forests in Scandinavia. The cellulose is a filler that allows the casing of the sausage to relax and stretch without splitting during cooking. There is approx 0.4g of casing per sausage, which equates to the casing being 0.5% of the total product. We appreciate that some people have severe allergies, and may not be able to tolerate these coria casings. If so, we’re able to make the sausage filling and send it in a cryovac bag (minus the casings). Simply state this in the ‘Special Instructions’ box. It is so great to be able to enjoy sausages without all the nasties added and FINALLY be able to give my kids a sausage that they can have! The sausage cooking tips were perfect too, Definitely a family favourite! So pleased you love them … they’re our eldest daughters favourite variety too! So pleased to have found AIP Paleo compliant sausages! Not only do they fit into my diet, but they taste GREAT! Nothing added, nothing needed! Why fill a sausage with grains when you can fill it with pure beef instead? Love them. Thanks! This makes our heart sing to hear Nicole – thanks for letting us know! 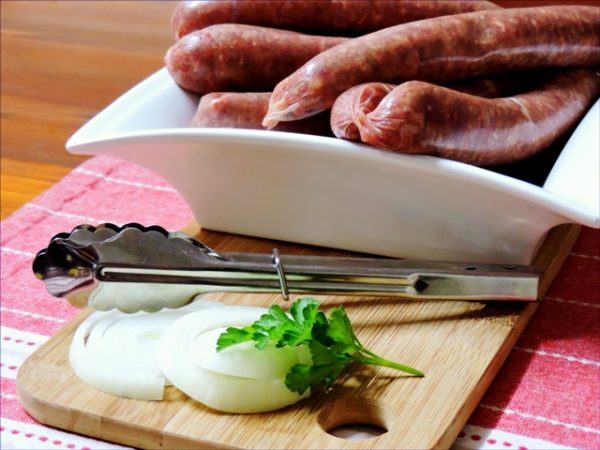 We know from experience how hard it is to find sausages that have real ingredients – especially when you’re trying to heal your body – that still taste decent.